Slovenia, an undiscovered gem and Europe’s best-kept secret with limitless cycling opportunities and friendly locals that amaze with their hospitality. Cycling through the heart of the majestic Julian Alps in the Triglav National Park, which is rich with alpine meadows, grazing cattle and century-old farms offering homemade shepherd’s cheese and other local delicacies. Enjoyable cycling adventures in pristine nature on scenic, safe and well-maintained roads on flat to rolling terrain and optional challenging climbs for those wishing to add extra miles. Visiting the picture-perfect alpine Lake Bled, which is watched over by a medieval castle perched high atop a cliff. While visiting the lake’s tiny storybook islet and its 12th century church you can make your every wish come true by ringing the bell of wishes. Marveling at the serene waters of Bohinj Lake, surrounded by lush green forests and limestone peaks. Conquering the 24 switchbacks of Slovenia’s most scenic mountain road through Vrsic Pass, which offers breathtaking views of snow-topped mountain peaks. Dinner at Hisa Franko, the family-run countryside restaurant and inn that is the home of Ana Ros, Slovenia’s best chef, whose appearance in Netflix’s Chef’s Table gained her well-deserved worldwide fame. It’s no accident that she was named the World’s Best Female Chef 2017! Ride along the Parenzana trail, a former narrow-gauge railway line that ran between Trieste in Italy and Porec in Croatia between 1902 and 1935. Today it connects people and countries as the Route of Health and Friendship. 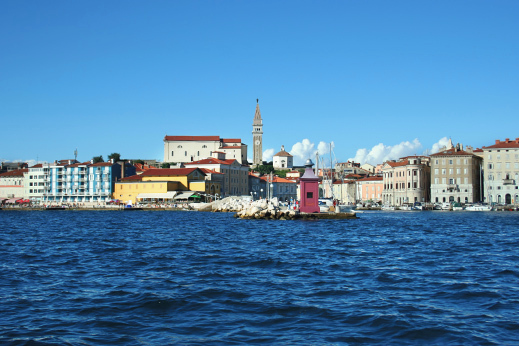 Explore the idyllic coastal town of Piran, which gained its wealth and power in the Venetian times from precious salt and trading routes dating back to ancient Greece. See our Blue & Green Istria Cycling Tour. 8 Transfer to Ljubljana and Ljubljana airport or nearby airports (optional). End of tour. Start your trip in a bustling and charming Ljubljana, Green capital of Europe in 2016. Arrive to Ljubljana, the cosmopolitan capital of Slovenia (30-minute transfer from airport to the city center). Ljubljana has become one of the most vibrant cities in Europe, with trendy neighborhoods and vintage bicycles swooshing through the old city center, which is reminiscent of Prague. Ljubljana, the 2016 European Green Capital, is a city full of beauty and inspiration, an oasis of lush green parks, open-air libraries, winding cobblestone streets and countless bridges crossing the lazy waters of the Ljubljanica River. Explore the ancient stories of the city in Ljubljana’s 11th century castle and immerse yourself in this unique city. Meet your guide in the afternoon for a trip overview and welcome dinner. Transfer from Ljubljana to Kranj where you start cycling. To make sure you will be riding safely and comfortably we first make sure the bike fits you properly and then warm up before riding to the Alpine part of Slovenia. We cycle on flat to rolling terrain on paved side roads with little traffic. Pass Begunje, the home of the Avsenik family, world-renowned ambassadors of traditional Slovenian folk music. 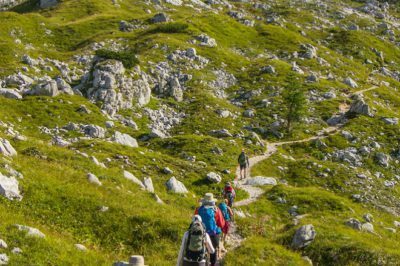 Pause for a picnic lunch set up by your guide on one of the alpine meadows before continuing to Bled, one of Europe’s most scenic spots. 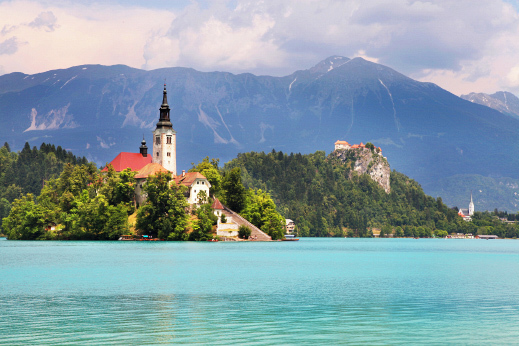 Bled’s picture-perfect setting is centered around the lake, where a 12th-century pilgrimage church rises proudly from a tiny storybook islet in the midst of its waters, guarded by the medieval castle perched high atop the cliffs. We spend the afternoon exploring Lake Bled and enjoying the spectacular views while strolling past Vila Bled, the former residence of Yugoslav president Tito. Our small boutique hotel is filled with antique furniture that reflects its 110-year-long history, but also offers a modern swimming pool and spa area where you can regain your strength. Tonight’s dinner celebrates seasonal delicacies, such as spring asparagus soup and cherry tart or autumn pumpkin soup and chestnut cake. Challenge yourself with a morning climb to the Pokljuka Plateau (optional) or simply relax with a cappuccino by the lake and let us drive you to the top of the hill to save energy for the rest of the day. We cycle on forest trails, passing green meadows with grazing cattle where you can pause to take a photo of the wooden cottages that look like something straight out of a fairy tale. 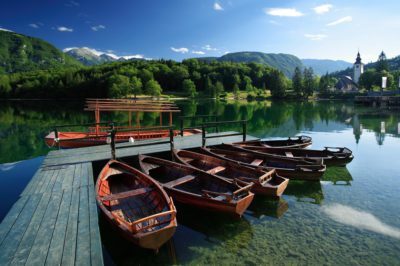 Pause for a refreshment before you descend to Bohinj Lake, passing secluded mountain villages, traditional hayracks, and orchards of apples, pears, plums and apricots. While approaching Bohinj Lake take a moment to enjoy the sweeping views of the surrounding Julian Alps. Take a break for a swim in the lake and a well-deserved lunch, where you can try some traditional dishes of the upper Carniola region. After lunch we drive back to Bled where you can enjoy a leisurely afternoon at the hotel or continue exploring the sights and surroundings of this picturesque town. Tonight we dine at an old local inn where the traditional decor creates a charming backdrop to the elegance of modern culinary art, with dishes such as dumplings filled with rabbit ragout marrying the traditional and the modern. Zelenci spring, the source of Sava Dolinka river. 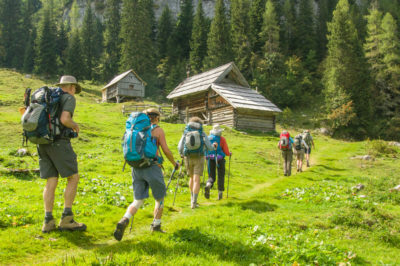 After a hearty breakfast we slowly climb towards the foothills of the Pokljuka Plateau into the remote Radovna Valley, a marvel for all nature lovers. An easy and flat ride leads you past a 400-year-old linden tree as well as an abandoned ironworks and water saw that were some of the first industrial plants in the Alpine region. We stop at one of the farms to try a local specialty called “ajdovi krapi” (buckwheat dumplings filled with ricotta cheese) and hear the unique dialect that is still very much alive here. In the afternoon we continue to Mojstrana, home to the first Slovenian Alpine Museum (optional visit). From there a flat bike path takes you into the heart of the charming village of Kranjska Gora, a ski resort that hosts many World Cup Alpine Ski races and is only a ten-minute drive from the Italian and Austrian border. Tonight we try diverse culinary delicacies that blend the traditions and tastes of the three neighboring countries into a unique gastronomy: sea bass with pomegranate sauce and aged vinegar, beet soup with orange and a drop of cognac, or deer ravioli braised in dark beer on a bed of red cabbage and topped with wild honey, to name only a few of the mouth-watering options. In the early morning we ride up Vrsic Pass (5316ft/1611m – optional), gradually conquering the 24 switchbacks of what is considered to be one of the most scenic and most challenging mountain roads for cyclists in Europe. This winding mountain road, following the twists and turns of an earlier trading route, was built for military purposes by Russian prisoners of war during the First World War. The border between Italy and Yugoslavia used to run through Vrsic Pass and nowadays the road sets the bar of endurance for eager road cyclists. Pause at the top to take some photos and regain your energy with a tasty picnic lunch before descending past 26 switchbacks following the stream of the untamed Soca River, famous for its turquoise waters. 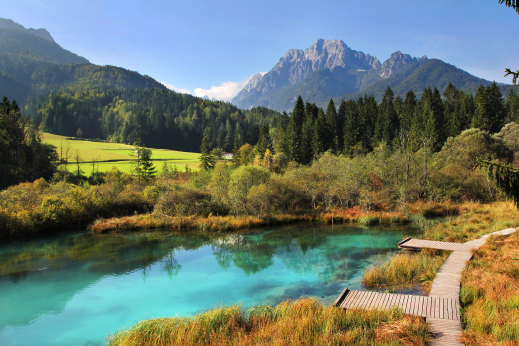 Soca is one of the few unspoiled rivers in the European Alpine region and its tumultuous waters even provided the backdrop for some of the most climactic scenes in the second installment of the Chronicles of Narnia movie series. Reaching the small town of Kobarid we spend the night in Hisa Franko, the exclusive family-run inn and restaurant that is home to the gourmet creations of Ana Ros, whose appearance in Netflix’s Chef’s Table gained her well-deserved worldwide fame. She also received the title of World’s Best Female Chef in 2017! Ana’s philosophy is to use seasonal homegrown and local food, prepared with great attention to detail and spiced with her strong character. While dinner is being prepared we taste some of the best wines that sommelier Valter, Ana’s husband, collects in his wine cellar. It is no surprise that Hisa Franko was ranked among the top 50 restaurants of the World in 2018! Happy cyclists checking the harvest before wine tasting. 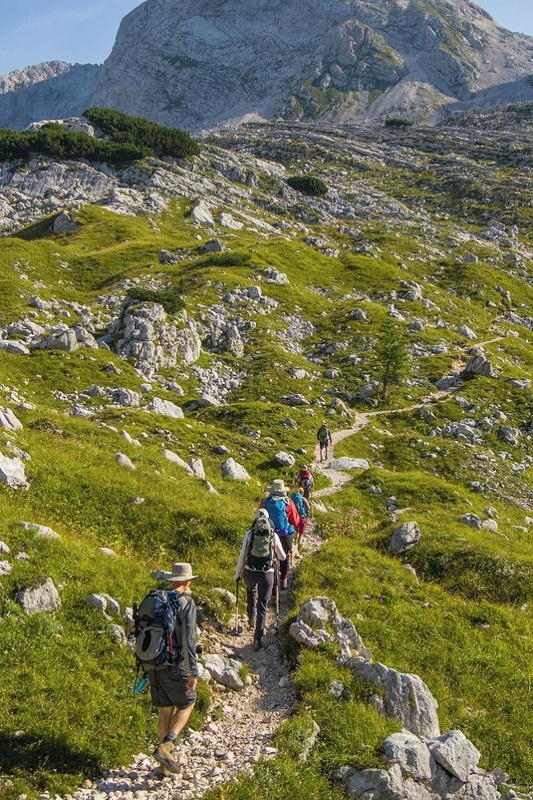 This morning don’t forget to try some delicious home-made herbal tea before we drive to the westernmost part of Triglav National Park, the Kolovrat ridge. This was one of the main settings for the fierce battles of the Isonzo front during the First World War, which were vividly described in Ernest Hemingway’s novel A Farewell to Arms. 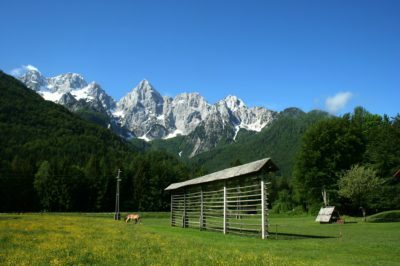 In the open-air museum you can visit the well-preserved trenches and enjoy the sweeping views of the Alps on the one side and Adriatic sea on the other. The perfect setting for another light picnic lunch! We continue south along the Idrijca River on rolling terrain surrounded by chestnut forests, towards the picturesque vineyards and rolling hills of Goriska Brda. 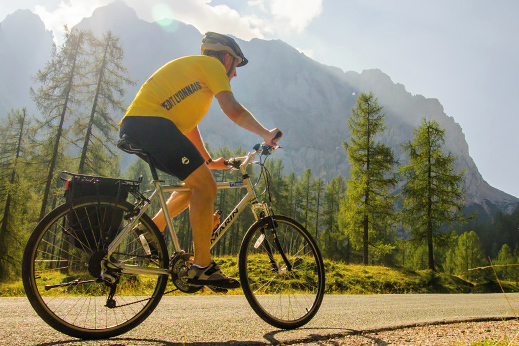 In a day’s worth of cycling you trade the magnificent Alpine views for the incredible scenery of sun-kissed vineyards and idyllic hilltop villages. This hilly region borders the Collio Goriziano region of Italy and resembles Tuscany with a Mediterranean flair. It is justifiably famous for growing the finest fruit and wine in the country. We visit local wine producers to taste and enjoy some of best world-renowned Slovenian wine, including Cabernet Sauvignon, Merlot and Rebula, the indigenous grape dating back to 13th century. Sit down to enjoy some mouth-watering farm-to-table food like home-cured prosciutto and other cold meats, a variety of local cheeses, wild asparagus, olives and home-made olive oil, cherry brandy and blackcurrant jam that you simply can’t say no to. Enjoy the company of your charming hosts, who possess that unique blend of Italian and Slovenian temperament and culture that is unique to the region. Being so close to Italy it would be a shame not to hop across the border for a cup of Italian cappuccino. So this morning we drive to Muggia, a vibrant Italian seaside town that is the perfect starting point for a day of seaside cycling. Stroll the cobblestone streets and try some of the best coffee and gelato that Italy has to offer as your bikes are prepared for the day ahead. The landscape has changed even more drastically as now you will be riding the Parenzana, a former narrow-gauge railway line that ran between Trieste in Italy and Porec in Croatia between 1902 and 1935. Now it connects people and countries as the Route of Health and Friendship. Ride along the Adriatic Coast past pebble-stone beaches, pine and juniper trees, and olive groves until you reach the seaside town of Koper at the end of the Istrian peninsula. Choose your lunch at the local market where you’ll be spoiled for choice by local vegetables, fruit, and fresh grilled seafood that will make your mouth water. 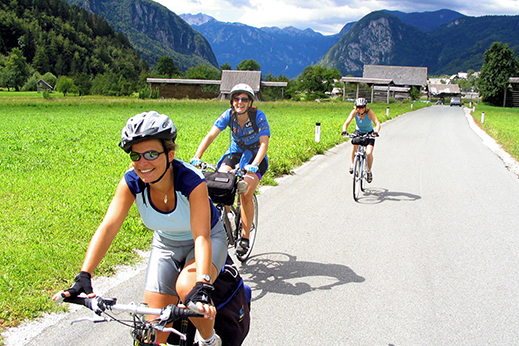 Continue riding on and off the bike path, on flat to rolling terrain, passing farms and sleepy villages. Soon we enter the Piran, a small coastal Venetian town that gained its wealth and power with precious salt and trading routes dating back to ancient Greece. In search of some unique souvenirs? Stroll the narrow medieval streets of the old town, where the famous composer Giuseppe Tartini was born, to buy some of the finest olive oil and products made from raw salt, which is still being produced at the nearby salt pans. Dark chocolate with salt is one of our favorites! Gather in the evening for an aperitif and a special farewell dinner of seafood delicacies. After all, all those miles on the road deserve a final toast. After enjoying one last cappuccino by the seaside, transfer to the city of Ljubljana and Ljubljana Airport (optional Trieste or Venice Airport). If want to cover more miles on your bicycle in beautiful surroundings, you can extend your holidays in Croatian Istria. Take a look at our Blue & Green Istria Cycling Tour. It was an excellent experience and we appreciate all of your work. The bikes were in excellent repair. We appreciated guide's recommendations about the route. Our bike route worked out really well.